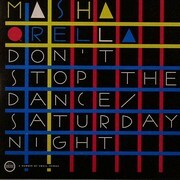 Masha Qrella conduct an inspired reworking of Bryan Ferry's classic "Don't Stop The Dance" (excellent 1985 track, same era as "Slave To Love") - turning Ferry excess and over-production into 4 minutes of moving, joyful guitar-pop. Masha Qrella illustrate they are master-arrangers, a band in possession of a pop instinct which bodes very well for (here's hoping) a worthy follow up to the excellent "Unsolved Remained" album from 2005. One of the catchiest, most inspired, feel-good records this year. - "Don't Stop The Dance"